In another example of a-holes ruining it for everyone else, and another dent in my Euro Bike Utopia fantasy, the Velib bike share program is in jeopardy. While millions of trips we’re ridden, Velib Extreme also emerged with vandals riding the bikes down steps, into metro stations, and on BMX tracks. I remember YellowBike efforts being derailed by theft as well, even after they painted the bikes bright yellow. Who’s to blame? Social decline or the end of western civilization? 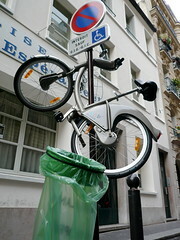 I don’t know, but Velib’s problems aren’t going to help bike sharing grow. Velib is back in the news on NPR. Uploaded by Jason Whittaker | more from the Bike Hugger Photostream.